Pep-up your poultry! A mineral supplement for poultry containing a blend of spices and vitamin C.
Poultry Pep is a tasty aromatic blend of minerals, spices and vitamin C that has a whole host of benefits to help support all round condition and encourage birds to eat their ration. What's in Poultry Pep it? Vitamins, Pro-vitamins, Micronised wheat bran, Calcareous seaweed, sodium bicarbonate, Germinated barley (dried at low temp & ground), fenugreek, fennel & aniseed powder, turmeric & angelica. Ascorbic acid is a white compound that is synthesized by poultry in the kidneys. During stress however, this ascorbic acid becomes insufficient to meet the bird’s requirements. Vitamin C helps reduce stress related problems such as poor immunity, feed intake, oxidative stress, poor growth, egg shell quality and egg laying performance. 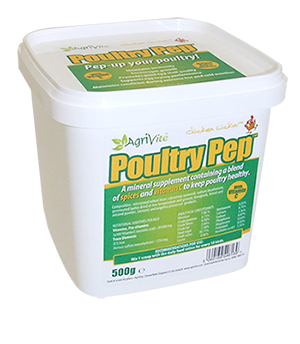 The addition of vitamin C in Agrivite Poultry Pep gives the product the perfect formulation for an effective all round supplement and moult treatment. Which Poultry Can I Use It On? How do I feed Poultry Pep? A mineral supplement for poultry containing a blend of spices and vitamin C.